This was using CP 1.0.482. I think it was user error on my end with no AVAST and MB exclusions present, but I would very much like you to look at the mini dump if possible and thank you for asking. Is there a way to configure Windows 7 to create both mini dump and memory dump? A cmd command maybe? In system and recovery I've only the option for either a mini or memory dump and have always left it set for mini, as the only software I have is Bluescreenveiw. System is all good, no hardware issues, only a 1gig OC on 3.3g i5 2500k which has never BS'd and SFC shows nothing. No Blue Screen since adding exclusions and I'm yet to add the 7 individual Mbam.exe paths to AVAST. I've never had to before, just the main folders and the MB system 32 drivers. 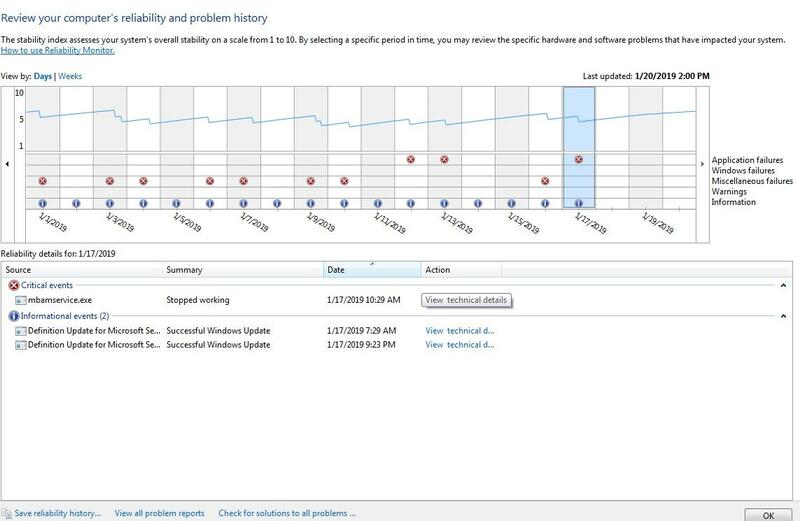 This is very very interesting, if i remember correctly from approx around October 2018 i would also get the same "on the odd occasion" windows failed to shut down properly message on the next restart. My Fix will be to wait for 1.0.527 to prove itself then once it has updated to that then i will turn off my "Automatically download and install application updates" Until the next update proves itself. PS: Got to love it 1.0.482 has decided to turn off my "Malware Protection" just noticed it now. Will see what happens on next boot but i am not overly concerned at this point because Avast Premier is doing its job. Take note of the complete memory dump information at the top. You will need to use option 2. Thanks for providing the dump file. I'll send you a message shortly with further details. Thanks again to everyone who tried and provided feedback on the test build. The new components update is being metered out and will be installed automatically in the background (providing the 'Automatically download and install application component updates' setting is enabled). To install this immediately from within the Malwarebytes user interface, click Settings > Install Application Updates. The components package version number is the same as the test build (1.0.527). To install this immediately from within the Malwarebytes user interface, click Settings > Install Application Updates. I did this on two computers, on one of them it took 3 retries to get it to find the new version.... just thought I would mention it. I installed the new version a couple hours ago. No BSODs (yes, I had a four our five of them along with my 30-40 hard freezes) but I did have a few anomalies so far, which may or may not be related. One was opening a text file in Notepad++. It just hung and I had to force-close the window. Worked fine the next time. The other was typing text into a web browser (chrome) window. It echoed the first three characters I typed, but it took about 10 seconds for the next characters to appear. Great! Thanks for the following up with the information. All good with my system as well using the new release 1.0.527. Ah, just as I thought! Was it the Russians or Global warming? Thank you guys so much for identifying a complicated problem and staying with us 'very random' freeze issues complainers. The complaints were all across the board. As an early complainer, your forum was invaluable to me, since I first identified a hardware problem, upgraded the hardware and OS, and it was fixed (little did I know at the time WIN10 was the real fix for me). The second workstation had the exact same motherboard, so I was convinced something wasn't happy with the particular motherboard. Then the third workstation with a different motherboard caused me to search out Malwarebytes to find if 'they' had reports of a virus freezing computers. Only then did I find two other users having the same complaints. That's when I removed (when there is smoke there is fire) Malwarebytes on the two remaining computers, also Win 7, and no more freezes. My point is, that if it wasn't for this forum I would not have suspected Malwarebytes created the problem. So the fact that you are so open with the forum and posts, was invaluable to me which saved a lot of work and time for me. Unlike some others, I had no issue with the lack of reporting of progress or a bunch of 'feel-good' statements that all is under control. Your transparency ('Houston we have a problem') was by far the biggest help for me! Thanks! And thank you so much LiquidTension for enduring the storm! My hat is off to you and all on your team for an excellent job, A+! Your team has saved my rear end hundreds of times with Malwarebytes and have generated countless dollars saved by me and my customers. You guys are still the best, including all your tools and identifying and grabbing up those excellent tools that we all have used before you got your hands on them. I was very hesitant, to install this update. I did install it 2 days ago, and so far, no freezing, with everything enabled. 48+ hours for me now, no more anomalies noted! I'm glad to hear the new version is working for all of you. Hopefully that continues to be the case and that this issue is resolved for everyone but please let us know if any issues do crop up. Will MB be pushing this update to everyone? Yes, in fact they already are, however as with all program updates, it is rolled out gradually/on a metered basis in a random/semi-random manner so not all users will receive the new version at the same time. My MB has also been working fine without any lock-ups under WIndows 7 for >60 hours. As usual MB on-line support was excellent. Personally I would appreciate a warning by E-Mail but could work with advice on a MB Facebook group if that is arranged and users advised that it will be used. My best regards also to the technical staff who identified and corrected the problem. Thank you LiquidTension and exile360 for your many hours of interfacing between us customers and your gurus. As a tired old hardware developer I decided early on stay out of the fray and let those with far more software savvy run with it. And they did very well. Congrats to all. Personally I regressed to 482 mid December and still sitting on it. If all holds together until February I'll switch to 527. But now that the fire is out and the smoke slowly dissipates, and everyone moves back into their comfort zone I find it interesting that many running only MWB had issues (like me), while others running only Avast or possibly another malware tool with or without MWB had issues. And I find your comment about "multi processors" having been affected by some MWB code in 508 really interesting. The problems people reported within 18 pages of this forum, to me ring of a variation/combination of Stuxnet, Spectre, and Meltdown aberrations. Just FYI for the next time in white water. A BIG thanks to the staff of Malwarebytes for resolving this issue. Just FYI, the original user in this thread has reported that their issue with Malwarebytes causing the system to freeze when using Windows Mail and Google Chrome has also been fixed by the latest release so I suspect the impact of this multithreading architectural fix in the Web Protection driver may have wider implications in improving performance and fixing previously seemingly unconnected issues with the protection components in Malwarebytes 3.